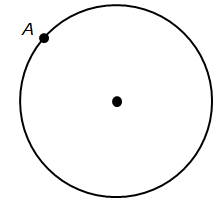 If points A and B are randomly placed on the circumference of a circle with a radius of 2 cm, what is the probability that the length of chord AB is greater than 2 cm? 120/360 =1/3 where the length of chord will be less than 2. We'll begin by arbitrarily placing point A somewhere on the circumference. 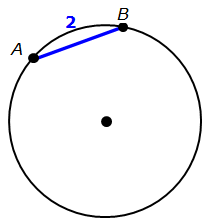 So, we want to know the probability that a randomly-placed point B will yield a chord AB that is at least 2 cm long. 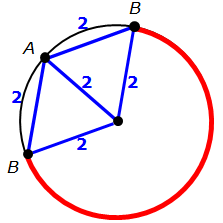 So, let's first find a location for point B that creates a chord that is EXACTLY 2 cm long. 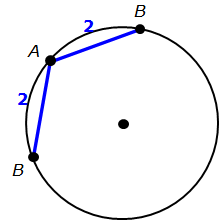 There's also ANOTHER location for point B that creates another chord that is EXACTLY 2 cm long. 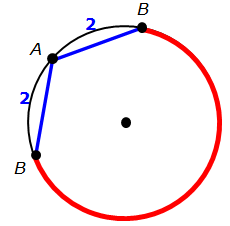 IMPORTANT: For chord AB to be greater than or equal to 2 cm, point B must be placed somewhere along the red portion of the circle's circumference. So, the question really boils down to, "What is the probability that point B is randomly placed somewhere on the red line?" Since these 2 triangles have sides of equal length, they are equilateral triangles, which means each interior angle is 60 degrees. 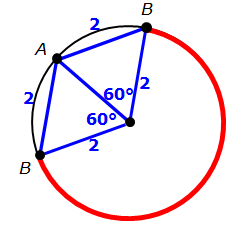 The 2 central angles (from the equilateral triangles) add to 120 degrees. 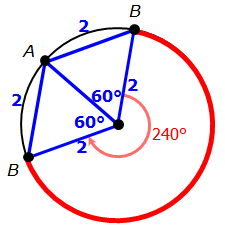 This means the remaining central angle must be 240 degrees. This tells us that the red portion of the circle represents 240/360 of the entire circle.